Up to now my low calorie pizza experience on a 5:2 Diet fast day has involved sharing a thin Lidl Margherita Pizza with Cooper, which is about 330 cals. I usually add mushroom, onion and a little tomato to my half and sweetcorn to Cooper's half. It's tasty and satisfying, but I thought it was time I looked for other options. 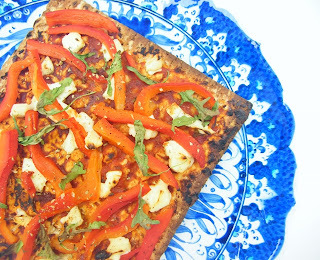 Recipes for Warburtons Pizzas or Wizzas as they are sometimes called are sweeping the internet as people search for low calorie recipes. 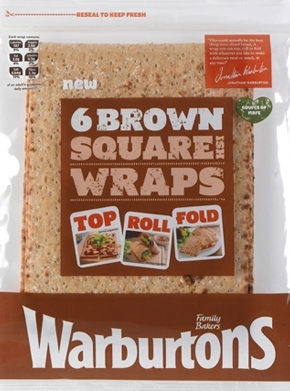 Warburtons recently sent me a hamper of goodies and while we are all in love with their teacakes in this house, and can wolf them down at an astonishing speed when they are toasted and dripping in butter (or dairy free spread for Graham), it was the new square wraps I was really interested in. The square wraps come in white, brown, seeded & half and half. The wraps are 187s calories each and they are suitable for vegetarians. There is no egg or dairy in these wraps, so they are vegan, but they're made in a factory where milk is used, so it depends on how strict a vegan is. Graham is happy to eat these because they contain no dairy or eggs. I used these as the base for my pizzas. 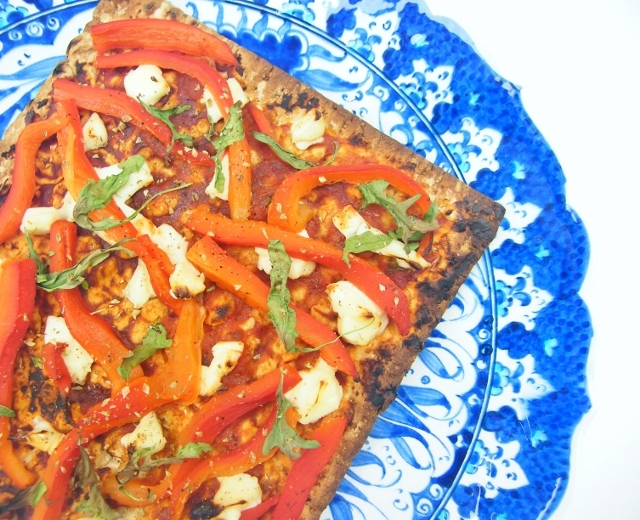 I topped my 5:2 fast day pizza with tomato puree, light laughing cow triangles, which have less calories than mozzarella, roast pepper and rocket. I finished off the pizza with dried oregano and black pepper. 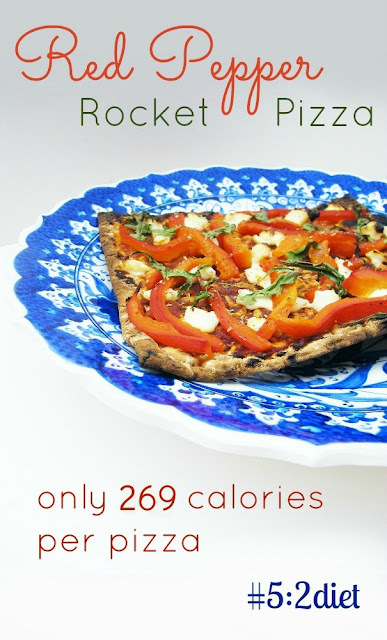 I used tomato puree for quickness, it contained 14 calories per tbsp, but if you want a more luxurious sauce, try my recipe for Homemade Pizza Sauce. A quick note on the peppers I use. 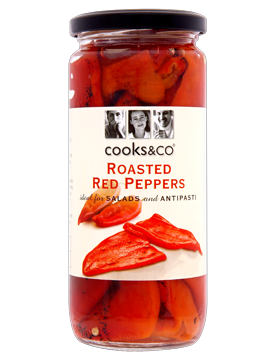 Since reviewing Cooks & Co Roasted Red Peppers last year, I have remained faithful to the brand and only buy their peppers. The peppers are stored in a mixture of water and red wine vinegar, which is much more pleasant than oil and lower in calories too. 100g of their succulent red peppers = 23 calories. 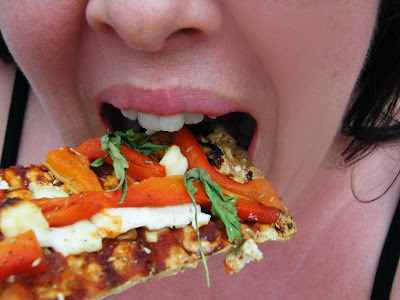 I loved my 5:2 Pepper and Rocket Pizza (Wizza). They are going to become a regular feature on my fast days. 1. Preheat the oven to 230c/210c fan/450f/gas mark 8.2. Spread the tomato puree evenly over the wrap.3. Slice the laughing cow triangles and scatter over the pizza.4. Slice the peppers and add to the pizza, then add some rocket (arugula).5. Finish off with a good sprinkle of oregano and some black pepper.6. Bake for a few minutes until the pizza is crisp and golden.7. Enjoy! Disclosure: I was sent some Warburtons Products to review. I was not required to write a positive review and any opinions expressed are my own. I bought the Cooks&Co Red Peppers myself and did not receive payment or products from them. Love arugula and peppers on pizza (a bit less keen on the laughing cow, but I suppose the goat's cheese could be a good substitute). Looks very tasty. You could add goats cheese, I went for the laughing cow to bring the calories down and it actually worked well. The cheese browned a little in the oven and was melty, just not stretchy like mozzarella, same milky taste though. Lovely to meet you at FBC at the weekend. Haha, you are indeed trendy! They're great, aren't they. I am on and off with the 5:2 diet. I had a break when I was on holiday, then it was London, so have to get back in the swing and lose anything I out on. I've become a flabread fan, and it's so nice to find a good wholemeal flatbread for a base for all sorts of burrito/pizza-y things. I'm trying to stick to 30 grams of carbs in general, and then do smoothies and salads for the two low days. It's working so far - a stone down...! Oh well done Tanita, that is excellent! Way to go! ooh absolutely LOVE this. I love those wraps, laughing cow & the peppers so this is right up my street - I need to get back on the 5:2 wagon, I have been very slack of late! I know what you mean, me to. Definitely getting back in swing next week. Holiday jaunts are over. Oh and try the pizza, you will love it!! I hadn't seen the new look blog till now, don't know when you changed, but it looks so fresh! I've been tempted by those warburton pizzas for a while now! Thanks Fiona, I changed it after the conference. I noticed my blog was too wide on my Nexus 7, so knew I had t change from 2 side psnels to one. I was inpsired to have a go at a new banner after seeing Elizabeth's over at Elizabeth's Kitchen. Haha, I took that. It was just one of those moments when you think "I know!". I made this for my fast day dinner tonight. It was delicious. Thank you so much for sharing. She'll give you an outlet for your passionate disappointment when you begin having that inescapable feeling of weariness with the entire thing.